NTSC 16:9 ratio; Dolby Digital 5.1, DTS 5.1, PCM Stereo. We have here a filmed concert from May 2017 given by a Latvian conductor and soprano, with a top German orchestra in its own hall, but the music is all Czech and (almost) entirely by Dvořák (there are three minutes of Smetana). Andris Nelsons has of course just taken over the Leipzig Gewandhaus Orchestra as its Principal Conductor (or, as the locals say, “Gewandhauskappellmeister”). This is in succession to Riccardo Chailly, who had held the position since 2005. So Nelsons inherits an orchestra of high pedigree and immense distinction, and on this evidence one of the very best in Europe. Alec Robertson’s old ‘Master Musicians’ guide to Dvořák, a product of the 1940s, is amusingly rude about the Carnival Overture, and extols the virtues of the concert overture Othello by way of contrast, insisting “It is high time it displaced Carnival”. Concert promoters and conductors outside the Czech Republic have not shared this opinion, for in terms of performances it is still a bit of a rarity. It is not an obvious choice as a curtain-raiser, and the composer had many doubts about using ‘Othello’ as a title at all. But as a one-movement evocation of Shakespearean tragedy it perhaps stands above Liszt’s Hamlet and Berlioz’s King Lear, if not as high as Tchaikovsky’s Romeo and Juliet (don’t write in…). It is certainly high-quality Dvořák, and the Leipzig Gewandhaus Orchestra's playing of it is excellent. The opening has plenty of atmosphere, and there is tension and turbulence as the drama gathers pace. Nelsons clearly enjoys the contrasting qualities of the piece, relishing both the lyrical and the more theatrical moments. And if it sounds rather more Bohemian than Venetian, the case for the work is made with even more eloquence than in that 1940s volume, and we don’t have to abandon Carnival. We turn from the Jacobean stage to the 19th century opera house, and from the sad tale of Desdemona to that of Rusalka, the water nymph of Dvořák’s fairy tale opera. The soprano is Kristine Opolais, a fixture nowadays in the world’s leading opera houses, especially the Metropolitan in New York where she sang this role in their 2017 production. Her ‘Song to the Moon’ is beautifully sung, with sensitive support from Nelsons. So too is the evergreen “Songs My Mother Taught Me” from the Gypsy Songs Op.55, but in its orchestral guise of course. Then it is back to Rusalka but this time for an orchestral item, the Polonaise from Act 2. This is a fine choice, and close to the polonaise in Tchaikovsky’s Eugene Onegin in quality, stirring in its high-stepping nobility and very well played. When Ms. Opolais returns she opts for a number from Smetana’s Dalibor (a sort of Czech Fidelio in terms of plot). This is rather more Wagnerian than Czech (the language apart) and sits a little oddly in the programme, though sung and played with passion and power. Then comes the third item from Rusalka, an aria in which the heroine, realizing she is still “neither woman nor nymph” despairs of the outcome of her all-too-human aspirations. This is the most moving of all, as Opolais gives full expression to this dramatic moment, replacing concert hall manners with a really operatic delivery and engagement, again with Nelsons ensuring close orchestral collaboration. At the time of this concert soprano and conductor were according to the booklet husband and wife, but no longer it seems. Her website announcement (March 2018) of their parting did however add “Mr. Nelsons and Ms. Opolais look forward to continuing their artistic relationship together.” Let’s hope they do, for the results here are excellent, and probably the best element of the programme. 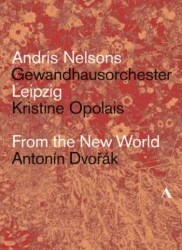 Andris Nelsons gives an excellent account of the New World Symphony if not one that is especially distinctive in terms of interpretation. He sets steady tempi, and slightly indulges the lyrical moments such as the lovingly phrased second subject of the first movement, where the principal flute makes the most of her opportunity. The Largo is pretty slow here, stretched to 14 minutes, when a slightly more flowing tempo can work just as well (Neumann in his early 1980s CD version with the Czech Philharmonic takes just 11:31 for instance). But the playing is outstanding, led by Gundel Jannemann-Fischer’s evocative cor anglais solo and with some hushed and poetic string playing. The wind players are not at all taxed by the broad tempo, apparently not needing to breathe. The scherzo is the movement that most sounds born and bred in Bohemia, and there is no dawdling at all, not even in the trio, which is delightfully relaxed in its bucolic charm. The booklet gives the timing for the finale as 17:28, when in fact it is 12:34, which is quite leisurely enough for an Allegro con fuoco, and a minute longer than some conductors have taken. But if Nelsons does not tear into the movement as others do, he gives the music plenty of impetus when required, and the coda is splendidly ebullient. No wonder there was an encore, the charming E minor from the second set of Slavonic Dances. The filming is unobtrusive, the camera going mostly to the player or section the ear needs it to – and since this is Dvořák, you will be able to recognize these woodwind players in the street when you are next in Leipzig. Nelsons uses the scores, and you often see how often and quickly he can glance down at the page and up again at the players. Picture and sound are good, though not so good that you need not consider the blu-ray option if that format appeals. The sound is at least well-balanced and captures the attractive acoustic of the Gewandhaus I recall from the only time I heard a performance in it a few years ago. It makes me feel I’d like to return. Meantime this will provide an excellent reminder of the standards prevailing there, and not only for those lucky enough to be at this fine concert.